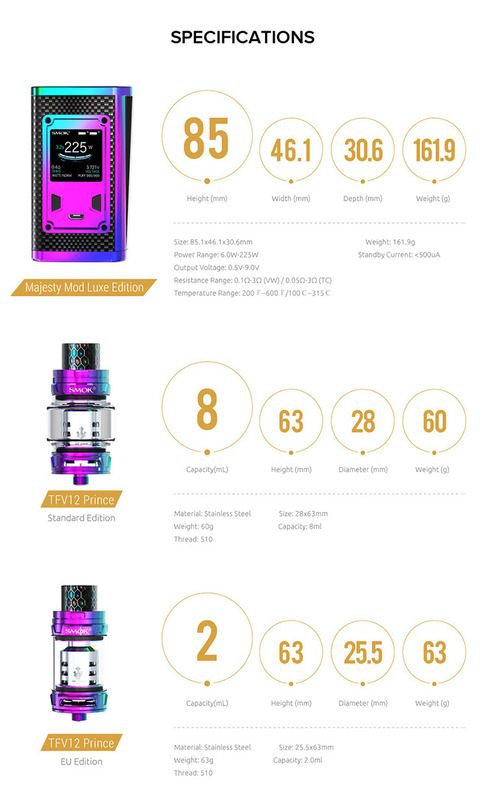 SMOK Majesty Kit Luxe Edition consists of the SMOK Majesty 225W Luxe Mod and the TFV12 Prince Tank. It features the Upgraded UI, dual battery life indicator function and the ergonomic big fire key. 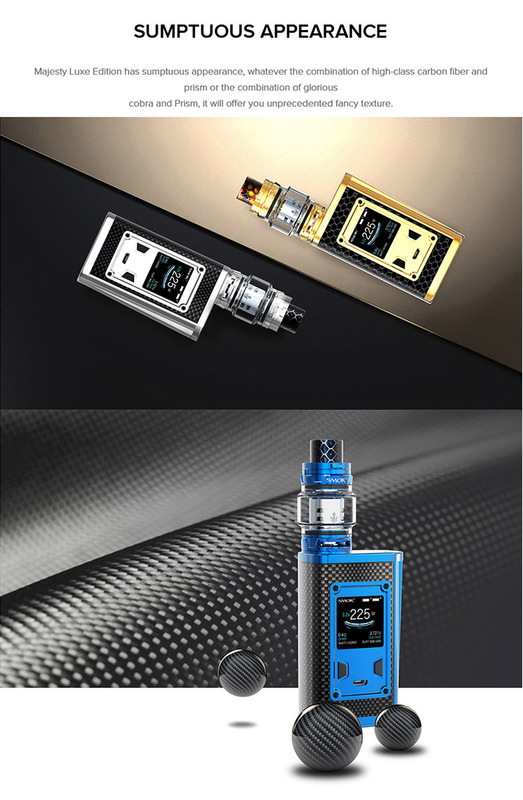 Attention: Shipping restriction: Due to exclusive distributor of SMOK, we do not send SMOK products to customers in Argentina、Australia、Brazil、Czech Republic、Denmark、Dominican Republic、Faroe Islands、Finland、Greenland、Israel、Norway、Paraguay、Poland、Russia、Sweden、Ukraine. 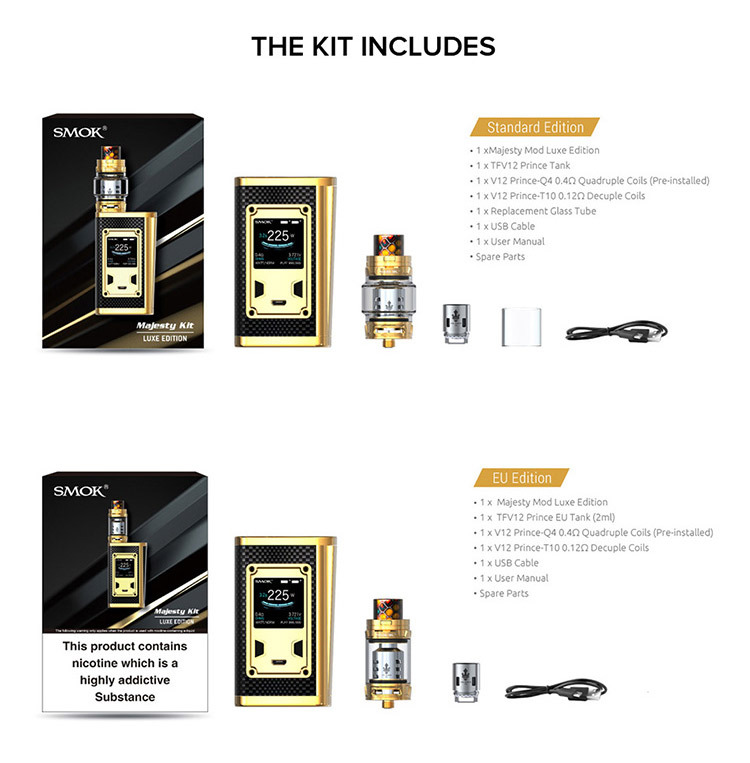 SMOK Majesty Kit Luxe Edition consists of the SMOK Majesty 225W Luxe Mod and the TFV12 Prince Tank. It features the Upgraded UI, dual battery life indicator function and the ergonomic big fire key. You can experience the ritzy, glossy appearance and the easy recreational vaping. 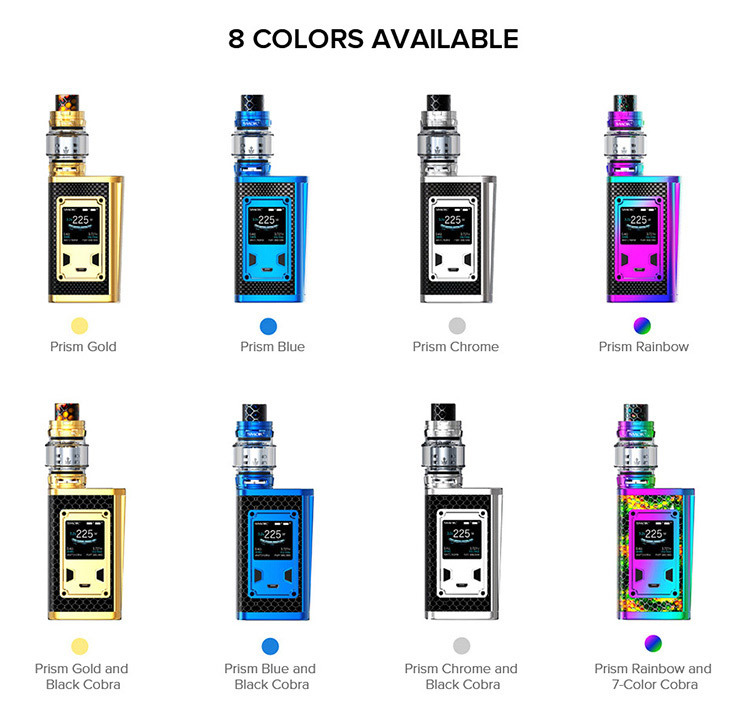 Pairing with the TFV12 Prince Tank and working with the different powerful cores, the Majesty Luxe Edition brings the vaping to new power lever. 6 Months for the atomizers and 3 months for the batteries, no warranty for the rest spare parts and excluding the human-caused problem. I really like the looks of the black cobra rainbow. Looks sick and vapes good to especially with the Q-4 coils. I love this. I have this. Pow3rful nice fun easy to us3 mod. Greta flavout huge vapor. Go ahead buy this, you will be satisfied. Dont forget include two batteries abd a charger.